James G. Gilbert, recipient of the Cary Edwards Leadership Award. The Cary Edwards Leadership Award recognizes individuals who have a longstanding commitment to improving the quality of life and promoting smart growth in New Jersey through sustainable land-use policy and practice. This year’s winner—James G. Gilbert—has been a tireless advocate for state planning, smart growth and sustainable development in New Jersey. As the first chair of the State Planning Commission, he was a driving force behind the initial adoption of the State Development and Redevelopment Plan in 1992, carrying out the mandate of the State Planning Act that New Jersey define and delineate those areas where future growth was to be encouraged and those that merited preservation and protection. Along with the adoption of the State Plan, he shepherded the commission and staff through the painstaking cross-acceptance process, the first effort to integrate state land-use planning with county and local master plans and zoning ordinances. Serving on the board of trustees of New Jersey Future for the past two decades, he has steadily and forcefully advocated for effective implementation of the State Plan, and for sustainable growth, environmental preservation, neighborhood revitalization and transportation choice. Recipients of the award are dedicated to strengthening communities by encouraging development where infrastructure already exists and by preserving and enhancing agricultural and natural resources. A past president and current member of the board of New Jersey Planning Officials, he has promoted public interest in municipal and regional planning, fostered the cooperation of planning and zoning boards throughout the state in furthering the aims of planning, assisted local boards with advice and encouraged the development of regional, county and state planning as an aid to local planning. As former chairman and member of the Englewood Planning Board, he has worked to implement sound land-use planning and regulation at the local level. And in his capacity as a member of the board of the Highlands Coalition, he has kept a close and watchful eye on the latest effort to ensure effective regional planning in an environmentally sensitive region of the state. 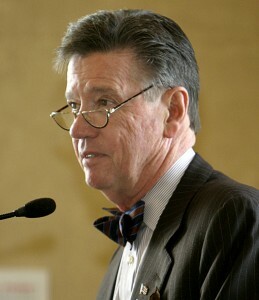 Mr. Gilbert’s many civic activities include former membership on the board of directors of the New Jersey Conservation Foundation; board of trustees of the Community Theatre in Morristown; board of directors of New Jersey Common Cause; and Joint Advisory Board of the Bloustein School of Planning and Public Policy/Center for Urban Policy Research, Rutgers University. In his professional life, he is managing director-investments and wealth management advisor at Merrill Lynch, leading a team of financial advisors in the Morristown office. Mr. Gilbert lives in Morristown with his wife, Kathleen, and their two children. Read New Jersey League of Municipalities Executive Director Bill Dressel’s letter of congratulations to Jim Gilbert winning the Cary Edwards Leadership Award at the June 9 Smart Growth Awards.